Today I have for you a Konad design inspired by Brooke, over at Babbling Brooke. Hers is the very first polish blog I really got into reading, and what inspired me to start up my own blog! I remembered one of her designs that I really loved, which you can see here, and was inspired to recreate this design on my own nails! For these nails, I used three coats of OPI Diva of Geneva for the base, which is a gorgeous color by itself as well (I have included a few pictures later in the post). 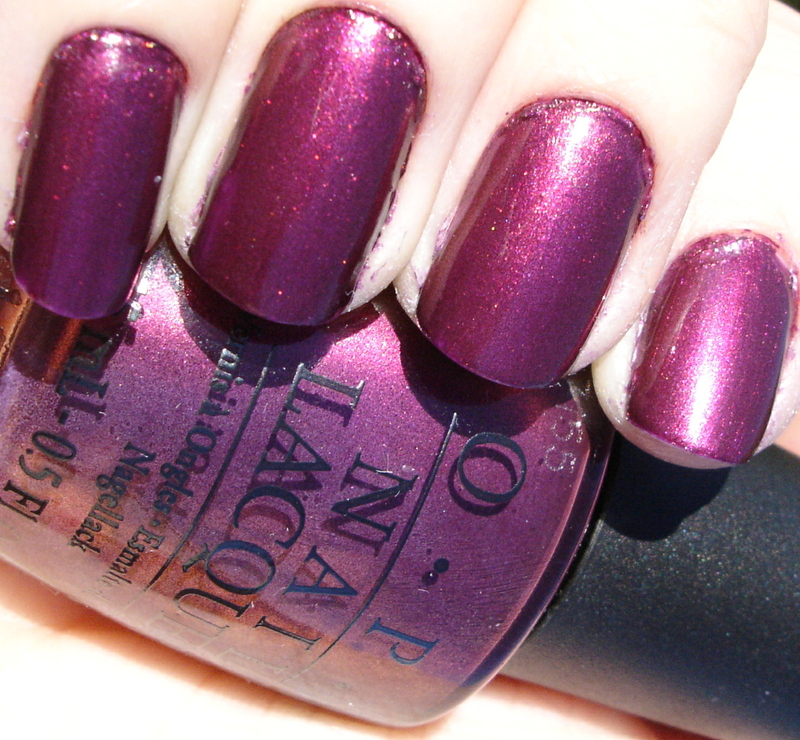 On top of that, I added Konad with plate m65 using OPI The Color To Watch. This is a gorgeous color combo, and super sparkly in the sun! I am loving it! In her post, Brooke mentioned that the design reminded her of the bubbles in Disney's Cinderella, and I agree that they are very whimsical and fairytale-like! I am really having fun with this one - definitely staring at my nails a lot lately! Above you can see Diva of Geneva by itself. It is a really pretty color by itself, and almost looks like velvet on the nails. I am glad that I picked this one up! So nice! 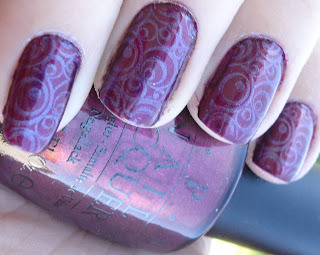 I wouldn't have thought to try Color to Watch for stamping but it looks like it worked well. love this manicure! you did such a nice job! Karen - Thanks! Honestly I probably would not have thought to use it either except I knew it worked so well for Brooke. 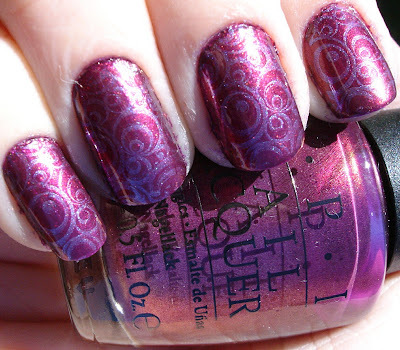 It is really gorgeous as a stamper! Toesthattwinkle - Thanks! I have followed you, good luck with your new blog! I love this!!! (and your super-sweet comment). This mani looks FABULOUS on you - and Fairytale Bubbles is such a perfect name for it!!! :) I wish I could paint my nails - I've been wearing a CND Shellac mani for TWO WEEKS now - no chips. I looks awesome, but I am SO desperate to paint my nails!! Thank you, and thanks for being the inspiration! :D I really want to try out Shellac as well, it looks so pretty and perfect from all the pictures I have seen. I think I would also really be missing painting my nails though, that is a long time to go without! I will be excited to see your Shellac when you get it posted!